You can read more about the program at the PhysicsCentral website. Registration is taking place now, but don't expect to see your kits until after the new year, usually around February if I recall correctly. You will receive an email when your kit ships. Since I've usually forgotten that I registered by then, it is always a nice surprise when they arrive. Order your free kit now for some mid-winter physics learning! Most kids like making gifts for their friends. My daughter usually comes up with something on her own. However, my son is a different story. The words "boys" and "crafts" typically don't go together, at least not in my house. An upcoming group event with our homeschool group had me contemplating what sort of crafty, gift-giving, project would appeal to middle school boys without involving explosives. It dawned on me that the answer was right under my nose...and on my son's wrist. My mom had gifted him a "Survival Bracelet", also known a Paracord Bracelet, several months ago. 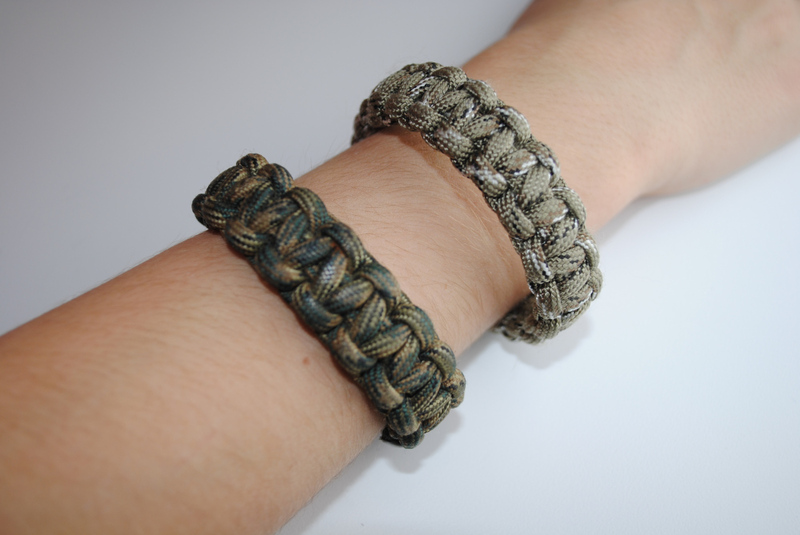 The bracelet is made of very strong parachute cord which could be used for a number of things in an emergency. Mostly, though, it just looks cool. As usual, I turned to Google and Pinterest to figure out how to make something. My search turned up two tutorials. The first is for paracord bracelets without buckles.These would be great for kids who are bothered by buckles next to the wrist, or if you simply had trouble locating buckles. Also included in this tutorial are great instructions for making a two-colored bracelet. However, I was worried they might tend to fall off and get lost. I found this tutorial for making bracelet with side buckles. Now that I settled on a project, I needed to find the materials, often an inconvenience when it comes to crafting. I'm sure buckles could be purchased at the local craft store, but I turned to Amazon first. I hate driving around to local stores in search of materials and I figured I might find a better deal online. I found 50 - 1/2" Side Release Plastic Buckles for $5.49 and free shipping. 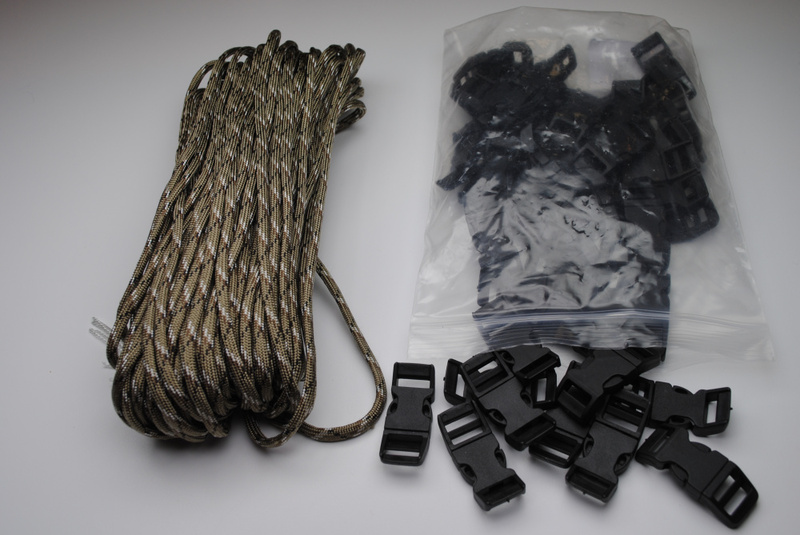 For the paracord, I found 182 550LB DESERT CAMO NYLON 100 FT CORD [Misc.] also with free shipping. Obviously, this would be a bit overkill for one bracelet (each one requiring one buckle and 8 ft of cord), but since I was planning this as a group project and I'm too lazy to drive to the store, it worked well. I'm not going to give you step-by-step directions and pictures since the linked tutorials do a fine job of that. My son, who isn't crafty at all, really enjoyed making the bracelet and now wears it proudly with the one that was gifted to him by his grandma. We'll be making a trip to our local Army supply store, which has a great variety and the availability of paracord by the yard, to purchase some more colors. We'll be trying a two-color one next. I see plenty of girls wearing more feminine color versions of these as well. With the total cost being slightly over $1, you can make a whole slew of them for Christmas gifts and stocking stuffers.